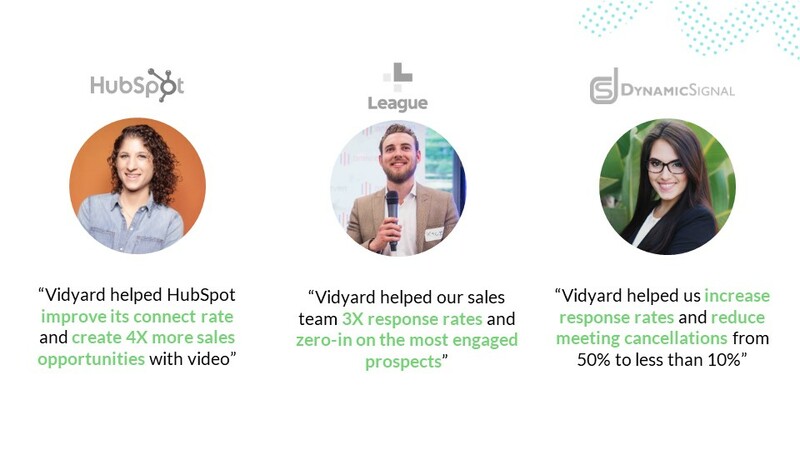 This is a transcript of the talk given by Michael Litt ,CEO of Vidyard, at the HubSpot User Group Meeting in September 2018, in London. As mentioned, my name is Michael Litt ,the cofounder and CEO of Vidyard. I'm obviously very passionate about video and we've launched a bunch of really exciting new products inside of this ecosystem, which I'm excited to talk about today. Before I get into that though, I am going to provide a little context of who I am and why this is a topic that is so important to me. 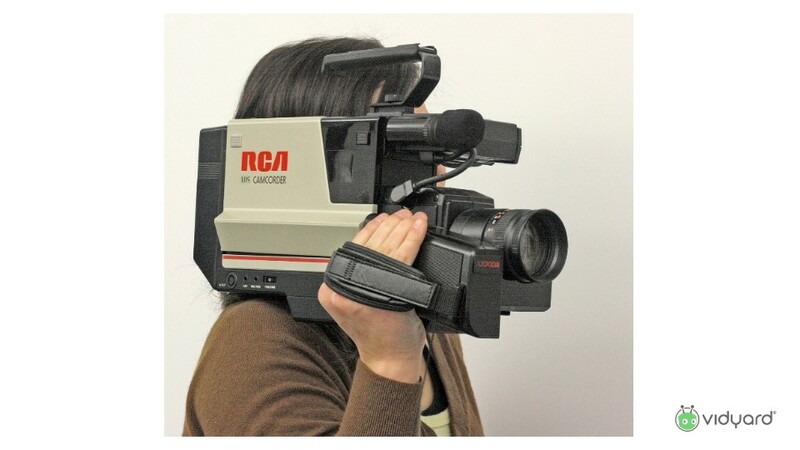 My uncle gave me a VHS camcorder when I was in the sixth grade and that was kind of the end of my family's privacy for any family event we had because I was the one carrying this thing around all the way through the nineties and I would create films and videos of all of our family events. And that's when kind of this obsession started before I got into computer programming. A little bit later in life, my co-founder, Devon Galloway, and I were on a road trip from Silicon Valley, San Francisco specifically, back to Waterloo where we were attending the University of Waterloo for System Design Engineering. And on that trip we started talking about opportunities to build a business together. We really liked working together. We'd done a lot of school projects together and ultimately realised that we had this experience creating videos and we'd interned at a number of companies and understood how to create videos and how to tell complex stories to help businesses market, sell and support their customers. And so, we started a video production company called Redwoods Media and we ran that video production company through the final years of Undergrad at the University of Waterloo and were able to start building the Vidyard technology during Undergrad. And so we actually launched this technology and this company outside of school. And one of the really exciting things about the University of Waterloo is when you build technology as an undergraduate, they don't take any IP in what you build, so the University of Waterloo is not on our cap table. Fast forward a couple years, we now have almost 300 people across three locations. We just did this really exciting integration with HubSpot. We've raised about $70,000,000 ,to date, and video still remains a passion. The company has a list of stakeholders which we hold very dear to our heart, we're hyper aligned with HubSpot in this matter. The customer comes first, then comes the team, then comes our community and ultimately the shareholders are aligned. We are a venture-backed company and we've raised about $70,000,000 ,to date, on this journey. Before I get into the topic of video, I wanted to get a rough idea of who's in the audience. So if I could get a show of hands, I'm curious, who here identifies as a startup? Awesome. Okay. And then, who here is already a HubSpot customer? I heard it's about 50 percent, we just wanted an idea. Okay. That looks like a little more. That's exciting. And then, hands up for marketing as kind of a core focus. And then sales. It's like 50/50 everywhere. And then who's using video already in either of those functions? Okay, so that's like the smallest number of hands. This is great. I'm here for a reason. Cool. So I'm going to start by talking about the concept of why video matters, because I think we see it every day in our social interactions. We're seeing it in Facebook, we're seeing it in Instagram, we're seeing it on LinkedIn and Twitter. It's popular with respect to consumer marketing. It's becoming more popular in B to B as well. But the real question that we wanted to answer as an organisation is why? So we'll talk a little bit about the stats behind it and the psychology as well. This is the stat that Devon and I really got excited about when we started to start the business. 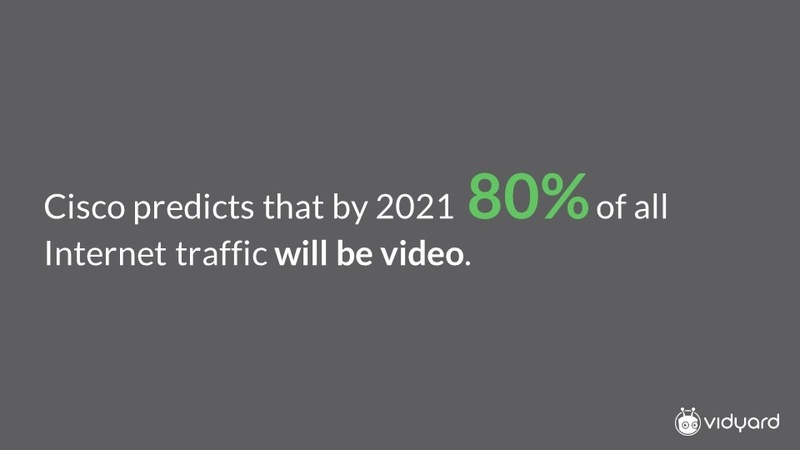 Now the percentage of Internet traffic that is video based is increasing year over year. It's going to be 80 percent. Now this makes sense. A video as a file type is very large, right? And so when you're sitting at home watching Netflix, you're streaming gigabytes of content. When you're opening your email, it might be looking at kilobytes of content. So this makes sense. It's the growth of this number, which is really exciting, and so the market ultimately grows in conjunction with it. 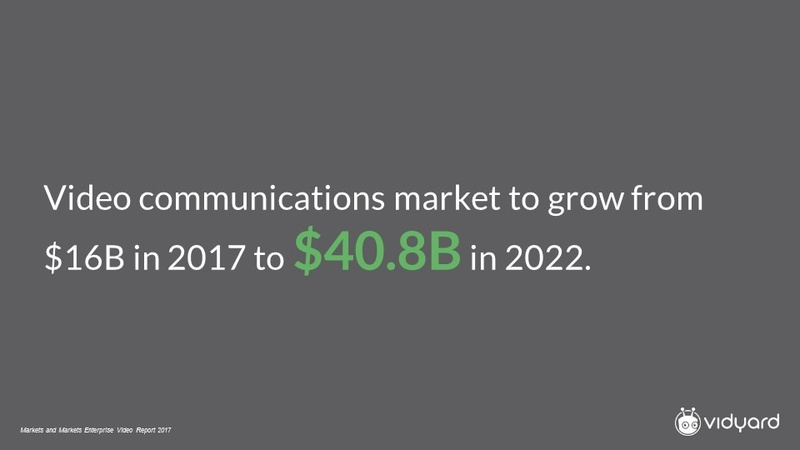 The video communications market, this is all video software,all video services, is expected to go from $16 billion in 2017 to about $40.8 billion in 2022. Now this is a preliminary stat that was released in 2017. This is actually reported to be getting bigger, as again, companies are starting to use video more effectively and this comes from the Market and Markets Enterprise Report of 2017 . Forbes did an analysis and they did what was called the 2018 Video in Business Benchmark Report ,where they interviewed a bunch of companies and buyers of both consumer and business products, so both ends of the marketplace ,and 90 percent of customers indicated that video helps them make buying decisions. So video is part of the educational process of learning about a company, a technology or a service. Makes sense people are watching and consuming video during the purchasing cycle and further to that, 64 percent of customers say that seeing a video makes them more likely to buy, and so if these stats aren't jumping off the screen, if you're not using video in your purchasing process, on your website, in your sales process, in your support process, you're missing a huge opportunity with your buyer. We will get into how you can do that a little bit later in the presentation. We'll also get into the psychology of why this matters. 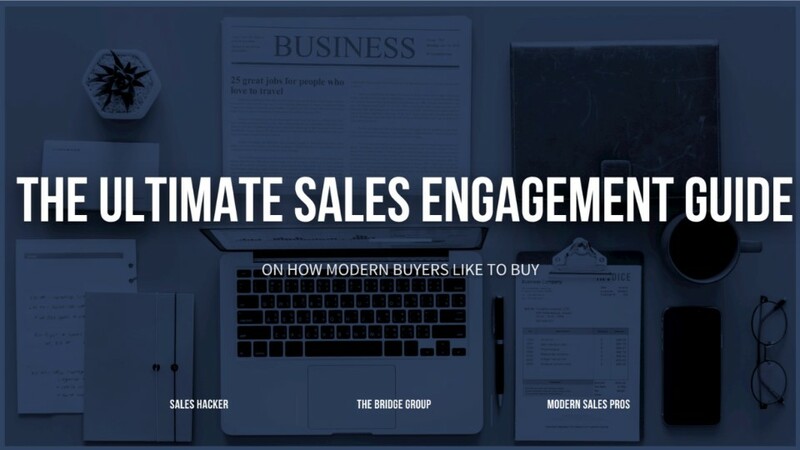 Another interesting thing that happened just last week was a North American company called Sales Hacker , which was an independent consultancy, until they were purchased by Outreach a few weeks ago, launched this ebook, interestingly enough, if eBooks are still a thing, called the Ultimate Sales and Engagement Guide, and the subtext here is On How Modern Buyers Like to Buy, and this is a really, really great resource. I think it's worth it ,because they analysed thousands and thousands and thousands of companies ,across a variety of segments and so they went from zero to 20 million in revenue all the way up to $500 million dollars plus now the vast majority tend to be focused into these smaller businesses, which is obviously very exciting for us in the HubSpot market and a couple of things really jumped out in this report. 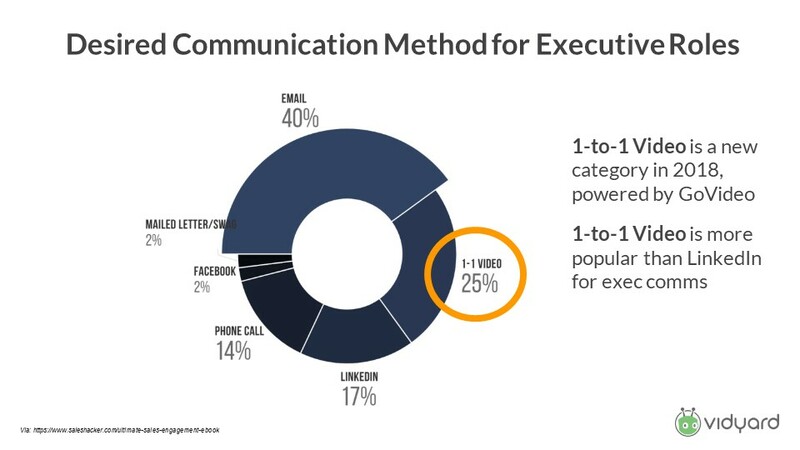 The desired communication method for executive roles ,as of last year, one-to-one video wasn't even a category on this report, but today, 25 percent of survey respondents said that they preferred one-to-one video and one-to-one video is actually more popular than LinkeIn. So if you're using InMail as a method of developing a network and developing leads and contacts, maybe rethink that strategy, right? Especially when you're starting to contact and work with executives,because video is the preferred method. The next one here is the most desired channel for sales roles. 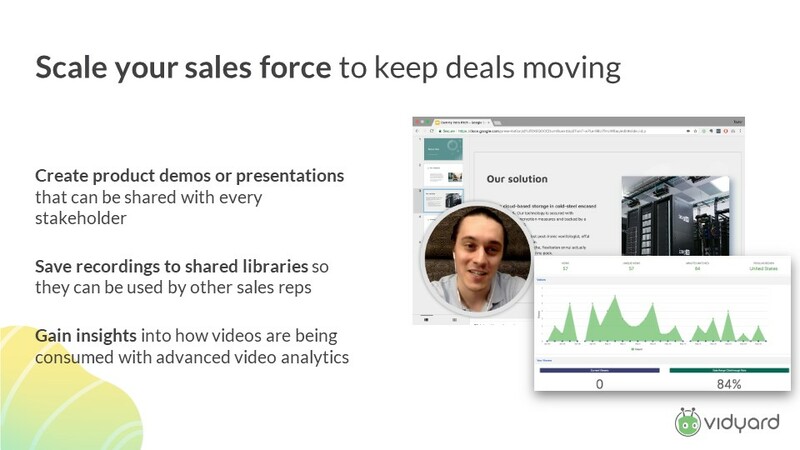 So if you are selling to anyone in a sales role whatsoever, one to one video is the number one preferred method of communication today, which is really, really exciting. Obviously interestingly enough, number two is webinars. 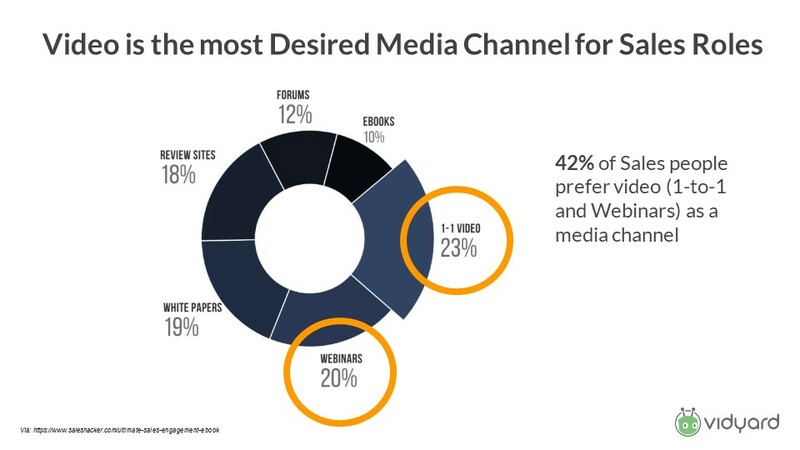 Webinars are also video, so 43 percent of survey respondents preferred video in some form when they're in sales roles. So video is absolutely exploding and again, up to one or even two years ago, it wouldn't have been nearly as intense as it is now, with respect to our market and the opportunity for video. Next one here, and I'm realising I'm data dumping on you, but this, this all has a purpose. This one here I actually got really excited about it, it relates to the finance industry specifically. 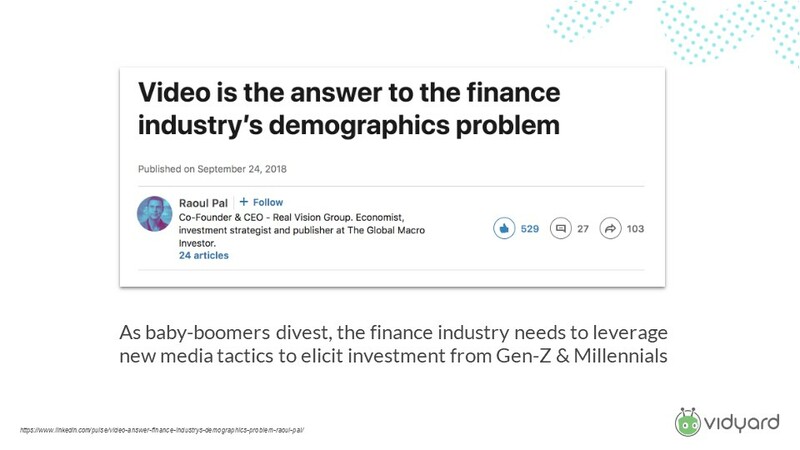 The finance industry has a bit of a challenge right now, because baby boomers, which are my parents, I'm a millennial, my parents have retired and my mom, specifically, is starting to divest any of the assets that she's built up over her lifetime and she's spending those assets in retirement and she's told me she's not leaving me any money. And so to expect that bank account to go to zero, I think that's probably a very common thing and I'm very happy to have her do that. But what these finance companies need to do, these financial managers, these financial planners, that have all these divesting assets, is they need to figure out how to get people like me, investing in mutual funds and investing in a lot of these products that are designed to help us save for retirement. But of course millennials have low trust values and are very sceptical of the finance industry and the fees, etc. that are composed here. And so, they're moving to video in order to engage with this audience and try to get them involved in these products. We have a really exciting customer called loan Depot. Loan Depot is the fastest growing loan provider for home and automobile purchases in North America. And they have 600 agents using video, to specifically target this demographic, because video is a way of building trust. And when you think about buying a car or buying a house, those are the most emotional purchases most people make in their entire lifetime. And so as banks are divesting from retail locations and moving everything inside, how are they going to build trust with those buyers? How are they going to build trust on a considered purchase, which is the most emotional purchase that someone would make in their lifetime? And video showing the stats ,that it's important to a considered purchase. And so these organisations are really starting to invest. 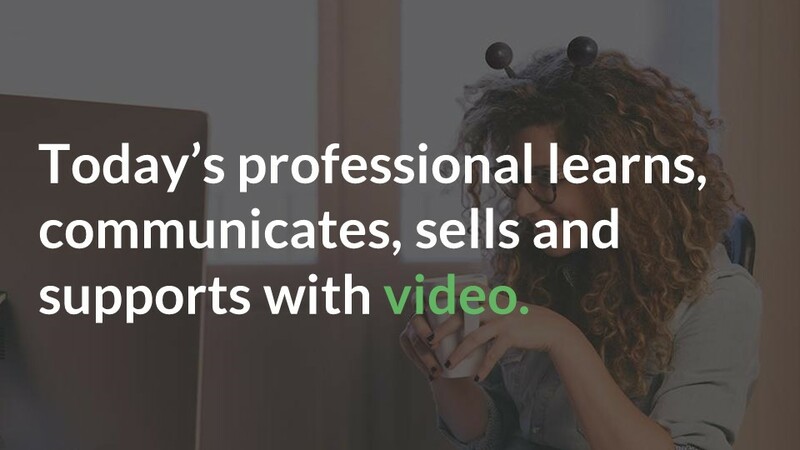 So the summary here is that today's professional learns, communicates sells and supports with video. 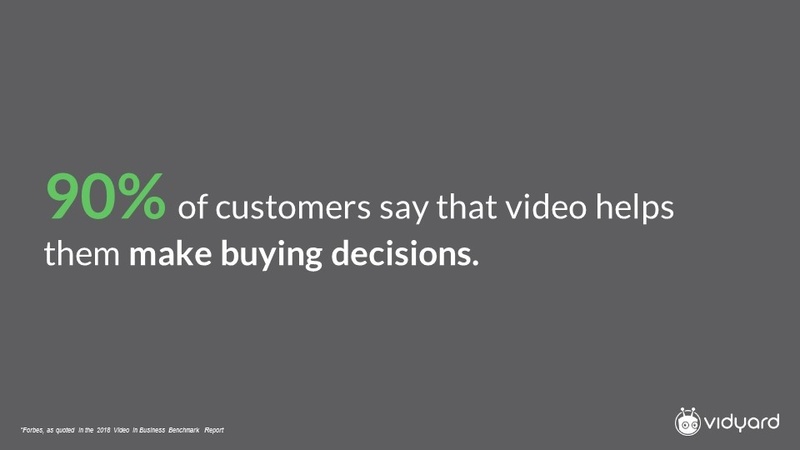 Video is an integral strategy to your content marketing mix. It's a great content channel, it's very effective. So why is that? Why does video matter? It's not just because everybody's doing it, there must be something to this technology and the method of communication that's driving this interest, right? So we worked with a number of psychologists and econ professor at the University of Waterloo to better define what's happening here, and the way I like to describe it is that our brain is separated into many parts but largely separated into two major components, right? There's the limbic system and there's your cortex. The limbic system is kind of like your lizard brain. It's the emotional aspect of your brain that gets excited, that gets sad that gets happy and basically makes you do kind of controversial things at some moments, if your cortex doesn't catch you in time. Your cortex is just there to keep you out of trouble and make you human. AI really only has a cortex. The big challenge with AI is that we're trying to program a limbic system, which is kind of scary. "Video triggers a limbic response in the brain"
So video actually triggers that limbic response. And if you think about getting an email, you get an email, it's a bunch of texts. It's a wall of text, when I see an email, the first thing I feel is frustrated because I have to read this wall of text. A video is able to tell a story, you're programmed to like interacting with humans and like interacting with human faces and emotions and experiences. 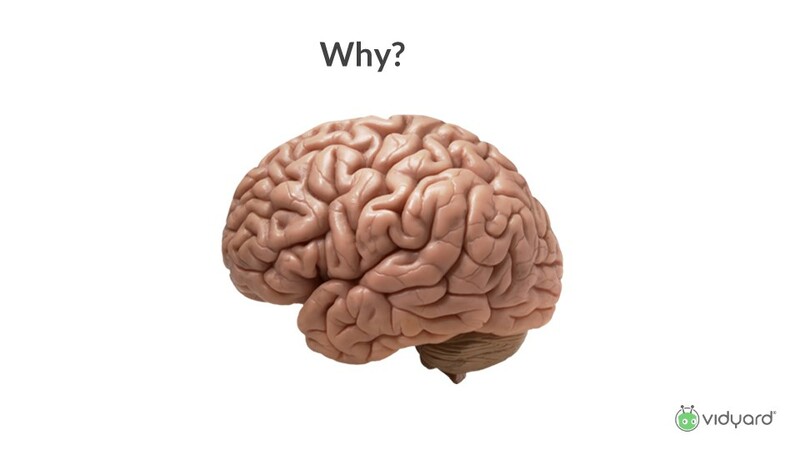 You can't trigger that limbic system with traditional texts or with an eBook, you can't really create that emotion. And so the limbic system breaks down into what we call the four e's. So engaging ,we're hardwired to engage in storytelling. The inbound conference is all about bringing people to a central location and to experience storytelling at scale. To create emotion. I wasn't at inbound this year, but I heard that during the Charity Water Session there was thousands of people in tears. Those people are going to leave the inbound experience with a new found love and appreciation for HubSpot as a brand and what it represents to them and what it represents to the market, because they support Charity Water. Emotional, emotional is another part of storytelling. You can use video to invoke more personal and emotional responses and we'll get into how you can do that specifically with technology. Educational. We process video faster and retain longer. This is why you have lectures when you're in university or when you're in any type of post secondary institution. You can try to learn just from the textbook, but it's much harder to retain that information than if it's communicated. And this is why there's such an opportunity for educational institutions to move to video. HubSpot's number one source of inbound traffic is the HubSpot Academy. There's 5,000 videos on the HubSpot academy that are designed to help you experience what inbound marketing is. When I'm talking to an interview candidate who's interested in joining Vidyard and needs to learn about marketing in general, I send them to the HubSpot academy. It's one of the best resources in the world to get educated on what's happening in this ecosystem. And the last one is empathetic. Empathy is a difficult thing to produce and is getting harder as we're losing trust in politics, as we're losing trust in corporations, but video is a way of creating empathy and a one to one way, because again, we're engaging with a human somewhere else in the world on the other side of a computer and not an automated email. The next one here is what I call the 10-finger-problem. I was looking around in the audience and everybody's got 10 fingers. 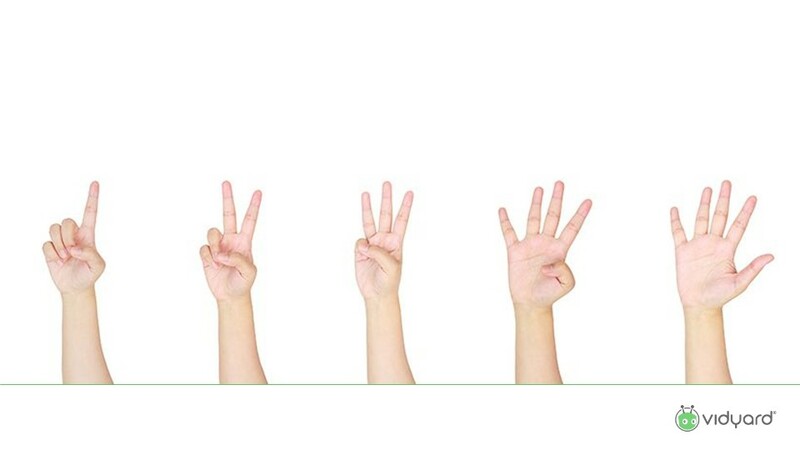 The concept of 10 fingers is that you use them regularly when you're inputting information into a computer. When you're using your laptop. Now we've started to exchange our 10 fingers for two thumbs. For mobile phones, it's hard to use 10 fingers on this display. You can try it on an iPad. Why are we doing that? We're doing that for the benefit of connectivity and convenience. We want to be able to communicate anywhere we are in the world, but that throughput is limiting us. And so with respect to social interactions we're turning to photos and video. Every single device, unless you work in a nuclear power plant, has a camera on it. And the fidelity of these cameras is getting better and better. My iPhone 10 here has two lenses that can actually create a depth of field perception as if I'm using a dSLR, it's a great camera. It's great for capturing media experiences. I communicate with my friends more through photos and video than I ever have before. Why? A picture is worth a thousand words. How many words is a video worth? It's too hard to communicate with thumbs as fast as I need to. And so we're moving to these rich media experiences because they trigger that limbic system in your brain. People fall in love with video and with video experiences, it makes them feel like they're there, way better than a text message ever could. 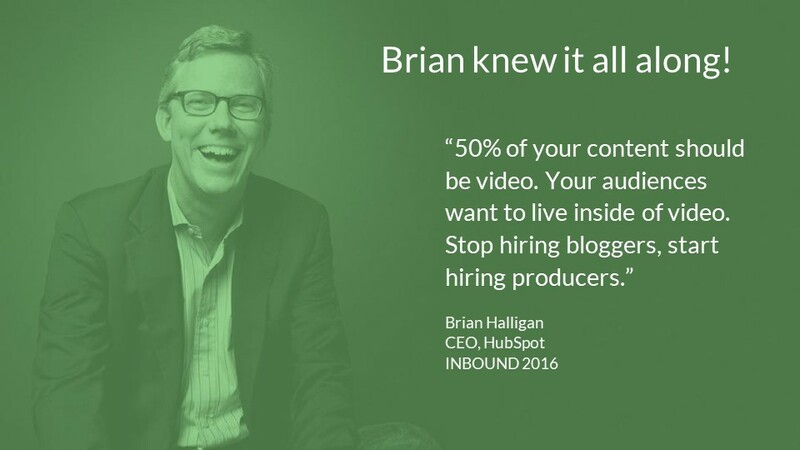 And of course Brian Halligan knew this all along, over two years ago at Inbound, he said that, "50 percent of your content should be video. Your audiences want to live inside of video. Stop hiring bloggers, start hiring producers.". And that launched HubSpot video. So I want to get a little more tactical now. And I also want to highlight that this is designed to be a very informal discussion, being with people that are invested in inbound, in using technology for sales, marketing and service is a passion of mine, believe it or not. So if you do have any questions at all as I start going through this material and some of the more tactical examples of how to do this, please raise your hand. I'm more than happy to answer those on the fly. Question: "How do you get around the problem of watching the whole video?" So there's a lot of ways that companies do that. The ideal situation is that the video content you're watching isn't too long, right? I would almost argue to the content marketer if your audience is (and you can see this in the attention span metrics) skipping around, they're looking for something. It's clear that your message isn't succinct and powerful or compact enough. And the argument should be made that if it was, it would take you less time to spend that 30 seconds watching the video,than scanning through the PowerPoint or through the eBook. And I'm assuming you're command-F-ing and searching for it or Ctrl-F-ing ,if you're using a windows machine like this. There's an opportunity and something that we're working on, which will automatically transcribe all assets and then allow you to search the transcription of the asset, as a feature inside of the player as well. And that will be coming, because every single video that is uploaded into our system is now transcribed automatically using AI and then a human can perfect that transcription and make that available. So that'll be coming in the next couple months. Question: "Will it be picked up by Google Search and show before YouTube?" Yeah. YouTube is the number two search engine in the world ,next to Google obviously. 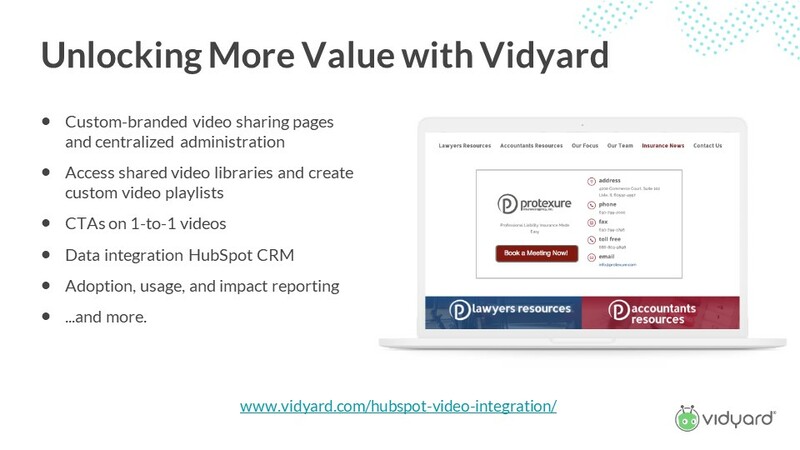 So yes, videos hosted in HubSpot video or Vidyard video will be indexed by Google. It's likely that they will prioritise their own assets and that's why it's important to have a profound YouTube strategy as well. So, we integrate with YouTube ,a video asset that is hosted on us and published on your website, and there's a lot of compelling reasons why that is important, which I'll talk about later, can also be syndicated to your YouTube channel as well. Question: "When talking about one-to-one, are you talking about using video as a response tool instead of writing an e-mail?" Yeah, exactly. I'll get into that in a minute here, but yeah. Question: "What is the difference in development from B-to-C to B-to-B?" Yeah. So far B-to-C video consumption has been very, very popular. And I think that's largely driven by the way brands are targeting purchasers and the types of communication "mediums" purchasers are using. The big news, which is driving this explosive growth in B-to-B video is that Generation Z's, these are individuals who are entering the workplace with mobile phones as their primary method of communication, expect video to be a part of the way they communicate and the way that they purchase. We hire a number of Generation Z's for our junior sales organisation, which just handles inbound calls and, this is insane and this is probably going to sound insane to this audience, when they joined the company, we actually have to teach them how to use email, which is bizarre. And so their preferred method of communication is video. And actually we built the GoVideo product on the basis of helping those individuals communicate in a way that was more natural to them and then the impact of that product, and perhaps HubSpot can talk about their own experiences with it a little bit later, is what drove us to productise it. Question: "To syndicate to YouTube, did I understand correctly that you have to be an enterprise user on HubSpot to use that feature?" Yes. To use HubSpot video, you have to be on pro or enterprise tiers. 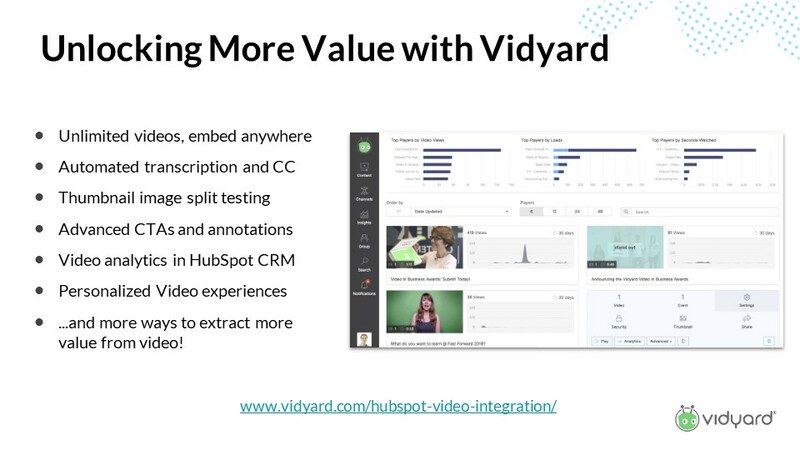 The free version of HubSpot video, does not include that syndication feature specifically, but all versions of Vidyard's core product do. 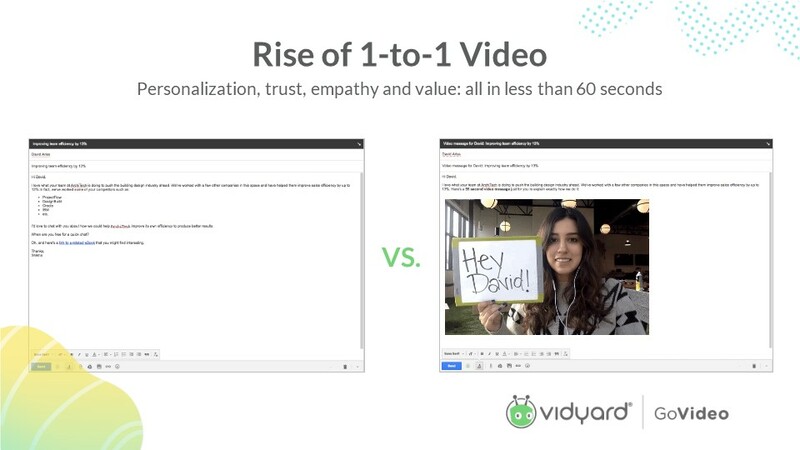 And so if you're using Vidyard, a YouTube syndication is a part of the platform. Question: "What's the role that VR plays?" So VR is essentially a video experience. It's this highly immersive video experience and all the concepts of the limbic response are obviously applicable to a VR experience. And about a year and a bit ago we completed an office renovation and we essentially renovated about 35,000 square feet of space. The total cost of doing that was kind of eye watering, it's in the millions of dollars and we're already out of space, so we have to go in and do that again somewhere. And so I always think about the VR workplace of the future, which is where anyone, anywhere in the world can be present in a room like this. So everybody in this audience could be sitting at home with a VR headset on. You wouldn't have had to commute here. And when this is done, you could take off your VR headset and spend time with your family. The implications of that are massive. A) A VR headset on a per head basis is a fraction of the cost of developing real estate. And when we run out of real estate, we just spin up a new virtual room and a virtual landscape which is much easier to get access to. B)Then the implication there is we could hire people, persons with disabilities that are mobility retained, persons who speak different languages and have their communication automatically transcribed as they speak. There's these time zone opportunities, you could essentially live anywhere in the world. So population density is reduced, which impacts food, transportation. The implications of VR in the workplace are massive, well beyond just the VR experience, but on the global spectrum of how we eat, how we travel, and ultimately how we consume our time during the day. I've personally invested in a number of VR companies that are working on this problem specifically, because I think there's a really interesting problem to solve here. And we have a VR setup at the office just to help our team to kind of engage with those experiences and think about what the future might hold. If you ever get a chance to try out Altspace, which is a Facebook product on the Oculus platform, it's incredible because what it's trying to create is experiences like this where you're at a live concert or live event, or a live presentation and you're sitting with people that are all over the world, distributed in their own workplaces and in their own homes. It's very cool. You can have meetings on the top of Mount Everest. It's pretty wild. It's kind of dizzying actually. All right, so we'll come back to the present here. This is HubSpot's new flywheel. The method of attracting customers. I personally love this because I found the funnel was always broken. Our company was obsessed with the progression of individuals through the funnel as they get towards purchasing, but obviously the funnel has leaks around the way and the funnel is a process oriented method of building your business, that ignores what is happening to the customer at each step of the process and the customer is obviously very important and you have to think about your business from the customer's perspective. So the idea here is that you attract your customers, you engage your customers and you delight your customers. 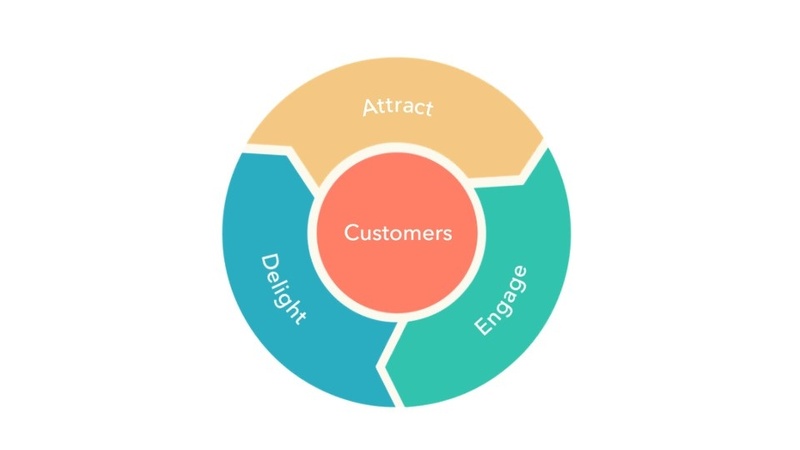 And we see that as the top of funnel, the first experience is that attraction, and that blends with engagement and then delight is once they start using our products and getting experience with who we are as a brand and what we can provide them. And so how does video fit into this picture? Video obviously plays a role at each step of this process because a percentage of your buyers prefer video as a communication methodology. It's a channel that your competitors are using, you need to be using as well. However, there's a challenge with video and that it's hard to scale. So how do we scale the use of video across teams and programs? You can't just go into your office after this and say, hey, everybody, we need to start using video,there is a big question of how? How do we use things like YouTube and Instagram? And how do we use video in email communications and on our website? We need a solution that makes it easy to do that, in a cost effective and system-of-record type fashion. Next one is integration. The last thing that I think anybody in this room probably wants is another product or platform that you need to sign into and use on a daily basis, right? We're already time strapped. We're always learning new technologies. Learning another new technology is incredibly burdensome, so this has to exist and implement into our existing workflows. And lastly, performance. We live and die on our performance. As marketers, as salespeople, as support professionals. If we're not generating pipeline and close business, we're losing our jobs ,and so how do we justify our time and our energy ? And if we start using video, how do we use the data behind video, ultimately to make it better? And so HubSpot video, which launched at inbound this year, is really the videofication of all of HubSpots products. In the middle of this product flywheel is this concept of CRM and video experiences around this product flywheel all have to associate data on the contact record inside of CRM ,to truly be effective. 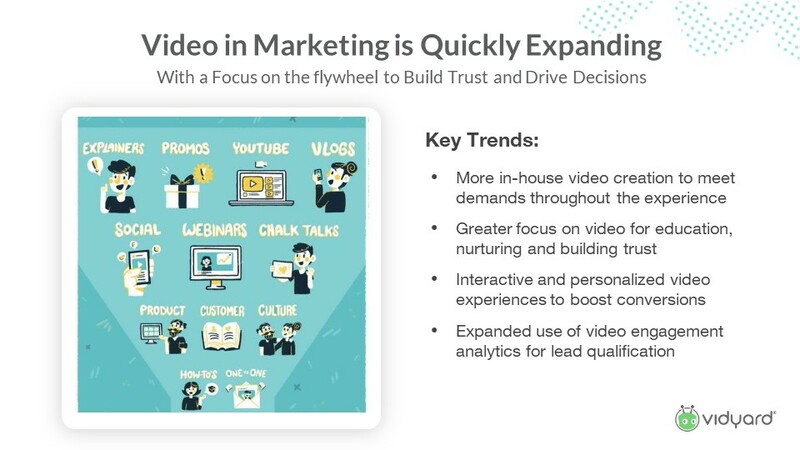 So video marketing is quickly expanding, with a focus on the flywheel to build trust and drive decisions. So key trends that we're seeing is that there's more in-house video creation to meet demands through the experience. So just like Brian Halligan said, "Stop hiring content writers, start hiring producers". I know there's some video producers in the room. I think the future is very strong for the awesome work that you do because, creative storytelling is becoming a better way of building trust and empathy through the purchasing cycle. A greater focus on video for education, nurturing and building trust. 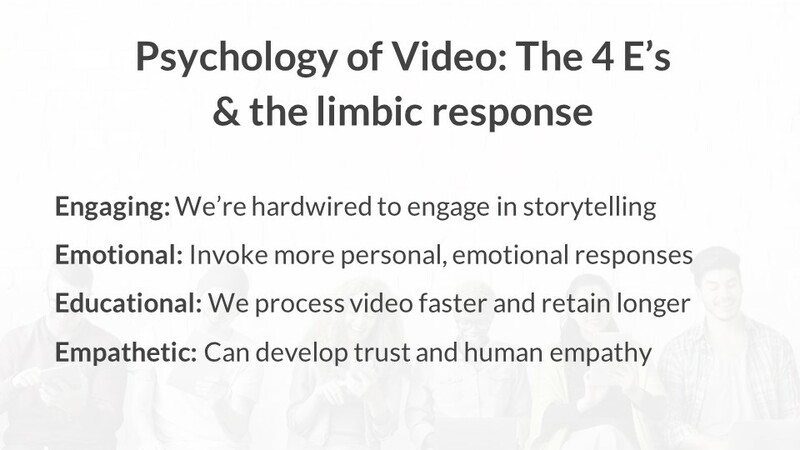 Again, we're getting back to this limbic response and why video is ultimately important. Interactive and personalised video experiences are being designed to boost conversions, so a video that is delivered just in time in your customer's journey, a video that is customised with their name on the thumbnail or their name and job title inside of the content itself is something that we can provide and is very exciting. And of course expanded use of video engagement analytics for lead qualification. Don't do it if you can't analyse it and can't understand how it's actually impacting your bottom line. So, it's very easy to use. 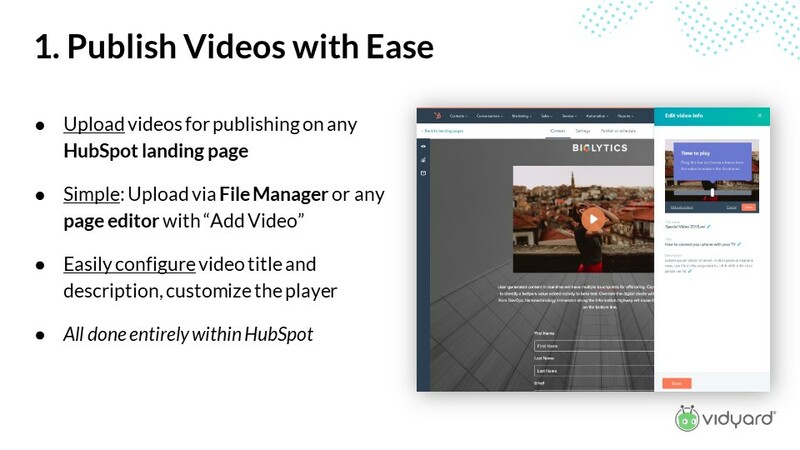 Again, if you're on pro or enterprise tier, you can upload videos for publishing on any HubSpot landing page, through the file manager on any page editor. You click add video, you click accept on the t's and c's, you are now labelled on the product. The exciting thing about HubSpot video, for us as an organisation, is it's obviously a black label. It's powered by Vidyard. We power the infrastructure and everything behind HubSpot video. I'm actually having a conference call with Brian Halligan later today because it's beaten all of our expectations in terms of growth and usage. We see about 350 to 400 new organisations a day signing up and starting to use HubSpot video. I should have asked, is anybody here already using HubSpot video? A couple small hands. Cool. Hopefully by the end we get a couple of big hands. Is anybody here using go video? Okay. Couple at the back there. That must be the sales crew hanging out at the back. Of course, you can easily configure the video title and description and you can customise the player, all within HubSpot. So you don't need to go and upload this video to YouTube, find the embed code, bring it over to your HubSpot landing page, and configure and struggle with that process of embedding the asset,it all happens inside of the HubSpot product. This was Brian's vision from the very beginning. It's all there, it's very effective. The next piece is driving conversions with call-to-actions. We see this time and time again,where people use YouTube on their homepage. There's nothing wrong with that. And again, you want content on YouTube. It's the second most powerful search engine in the web. However, when a YouTube video ends, what happens? And if your competitors are smart, they're infiltrating that experience with their content, right? So someone's on your website watching a video, they see a bunch of other content, they click to watch that content, now they're getting sucked into what we call the YouTube rabbit hole. So now they're leaving your website. You've worked so hard to get them there and they're leaving your website, going to YouTube. They're watching your competitor's content. And if they're like me, they go down the YouTube rabbit hole, right? People watch a lot of content and by the end of the day they've lost all this productivity and they're watching videos of dogs riding skateboards, right? We want to avoid that type of experience. And so the other answer isn't to let your video fade to black. It's to use it as an optimisation point to move people further along the process of understanding who you are and educating themselves on your company. So you can use it as a redirect! You can use a HubSpot lead form to capture information on the customer if they so decide to provide it to you. You can do that before you can do that after. You can send them from the video to your product or to your pricing page. The creativity that you can execute here knows no bounds, but if you're running your performance analytic systems correctly, you can understand where people should be going after they watched the video. And again, this can all be done entirely inside of HubSpot. It's very easy to do. Don't let your videos fade to black and don't let YouTube be a part of your customer experience flywheel. Unless you're YouTube, then you've done a really great job. So we talk about performance being absolutely essential to a marketers or salespersons or a service person's existence. 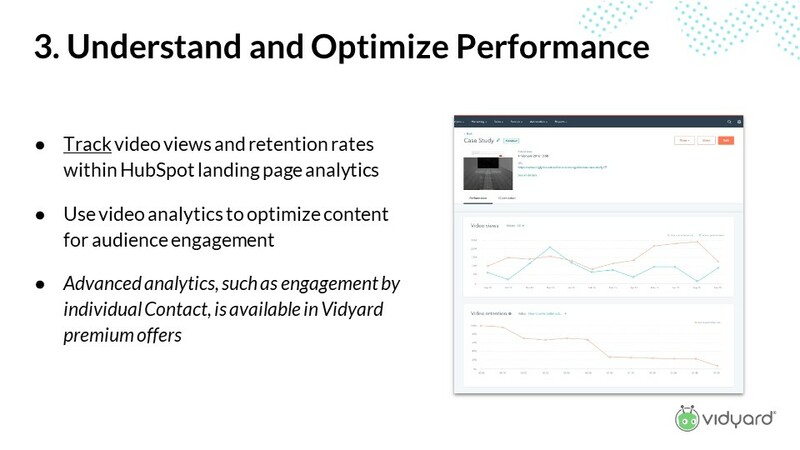 The idea here is that you can track video views and retention rates within HubSpot landing page analytics. So on aggregate you can see how someone is consuming content. We see this time and time again, where a company gets really, really excited about its logo and so every video on their website has a really cool animated version of it's logo ,that's 15 or 20 seconds long, and then look at the engagement and people click play and immediately stop watching the video. Why is that? They're on your website. They kind of have a rough idea where they are. They don't need to experience that logo animation. They want to get right into the content because they're impatient, like all of us. Don't waste your customer's time. Another thing we see is people really index to really highly produced content. We call It the super bowl syndrome. Everybody feels like their first video project needs to be like a super bowl commercial. That's not necessary at all. Because again, people are coming to find stories, replace that super bowl syndrome with a customer testimonial. 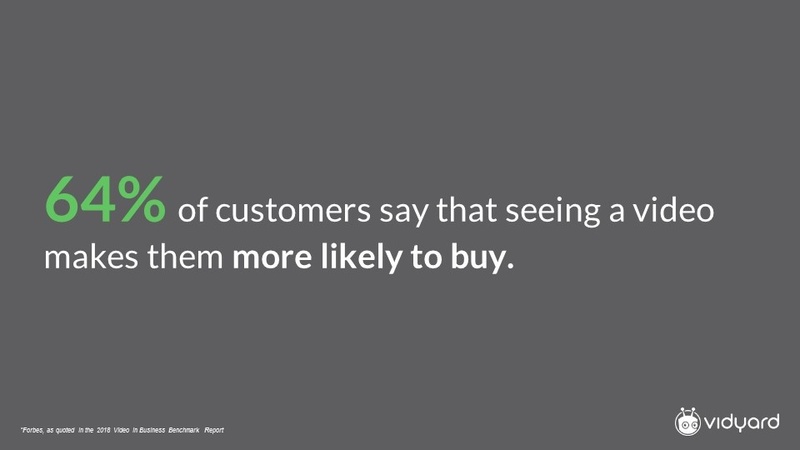 Let your customers tell your story for you, because your customers look exactly like your prospects. And again, these are the things that we learn by using engagement analytics more effectively and really understanding what's happening. 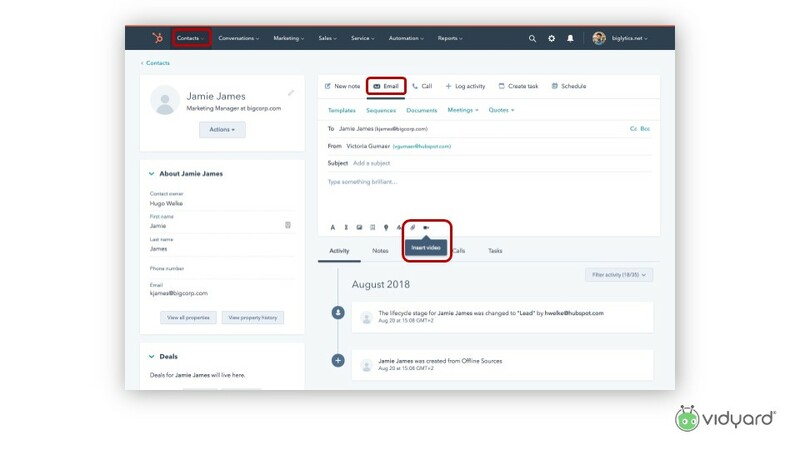 Advanced analytics, and this goes back to tying the information back to your CRM and system of record, by individual content, is available in the upgrade, inside HubSpot pro and enterprise. It starts at $250 a month. 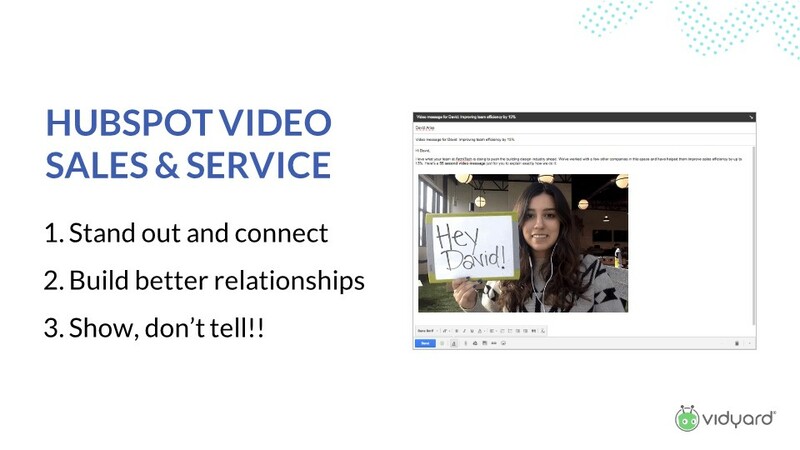 But what that allows you to do when you're capturing information from that audience is actually append that viewer engagement session on a video by video basis to the contact record inside of CRM. So when your sales team or your service team starts talking with that prospect or customer, they know which videos they've watched and how much they've watched and that helps give them context for the conversation, it gives them context for followups, etc. Some of the other cool stuff you get is unlimited videos. The thing that we've already talked about is automated transcription, closed captioning, right? It's very important for people that are watching video with audio off, people that are hearing impaired. It's also important for multi-language, which is increasingly important as businesses are becoming more global. You get advanced CTAs and Annotations. So this is the ability to actually add an annotation, kind of like what you see on YouTube as a video is playing. And so somebody is watching a video and they've already found out what they want and they want to take that next step in the process, why not give them that option in the content itself? Video analytics and HubSpot CRM already touched on that. And of course you can get access to personalised video experiences. This is where we're using your database to pull information and actually ,in real-time, inject it into the content. It's kind of like minority report for video, where everything is customised for the specific viewer. This is happening in the world. Google is doing this. We're doing this. Every video on your website could be dynamically rendered when someone arrives, with their contact information, their job title, and so every experience they have is designed and customised specifically for them. Couple of customer examples and the impact they've seen by using video specifically. Tradeshift is a click price quote company. They are dealing with competitors that are much larger than them, so they're using video to stand out and specifically to have customers tell their story. 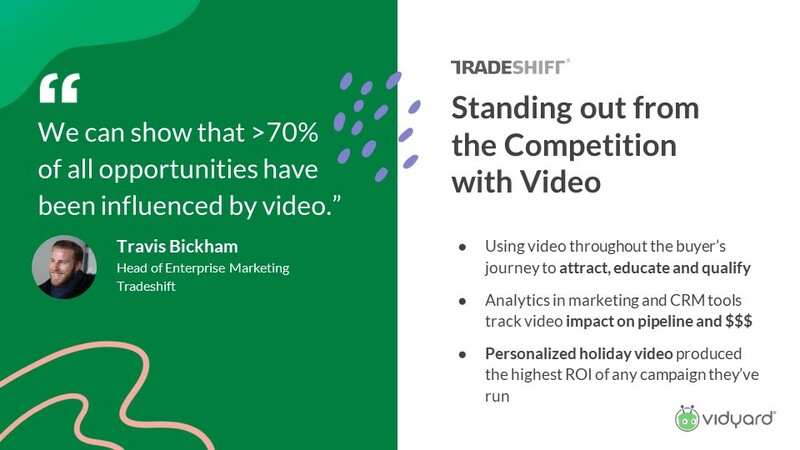 And by using video effectively ,across all of their destinations where they're sending people through this flywheel, they saw over 70 percent of all sales opportunities now being influenced by video. And the reality is that was probably happening before, but they weren't able to attribute it to video. 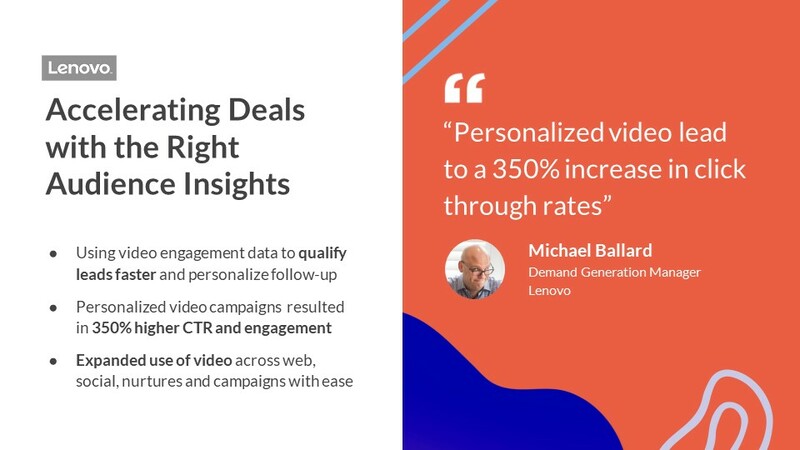 Video is a fairly expensive medium to produce, so by using HubSpot video and using engagement metrics and tying it back to see your CRM, you're able to actually justify the spend of video against sales and against the upside in your business. Whereas before, like a lot of stuff in marketing, it kind of looks like a bit of a black box. Lenovo, we all know Lenovo. Lenovo is a known brand, people recognise this brand , at least in North America, and yet they had really poor CTRs in their outbound email campaigns. And this is a problem that everybody has. Email response rates are dropping ,as it's becoming easier and easier to click back send on 10,000 registered contacts that you have in your database. And so they boosted the click through rate by 350 percent, which is a huge win in marketing speak, as I'm sure you'd expect, by using personalised thumbnails on video. So just by including the name of someone on the thumbnail in an email, they've boosted their CTR by 350 percent. "Video with a play button is the most compelling call to action on the web." First of all, video with a play button is the most compelling call to action on the web. You're also triggering their vanity response. That's my name. This content must be about me. I'm going to click that and I'm going to watch it. It's triggering that limbic aspect of your brain and of your customer's brain. 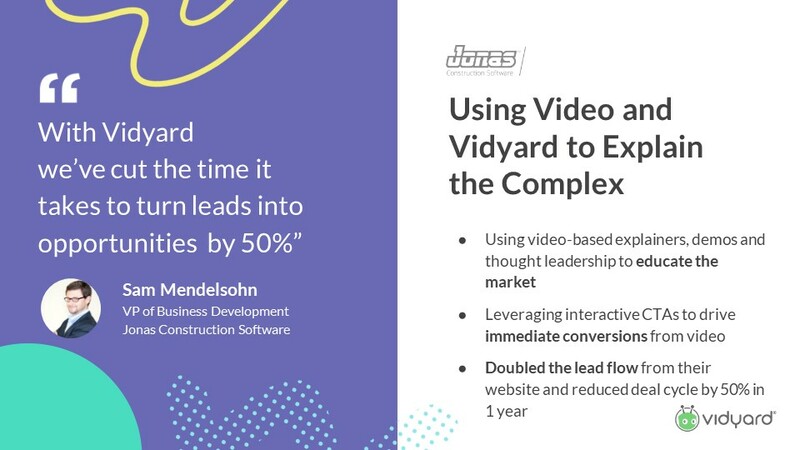 Jonas Construction Software, use video to explain complex ideas and showcase their customers, very similar to Tradeshift, and they doubled the lead flow from their website in less than a year. This was just by adding call to actions to their videos, that were collecting customer information. Customers were seeing themselves in these customer testimonials. 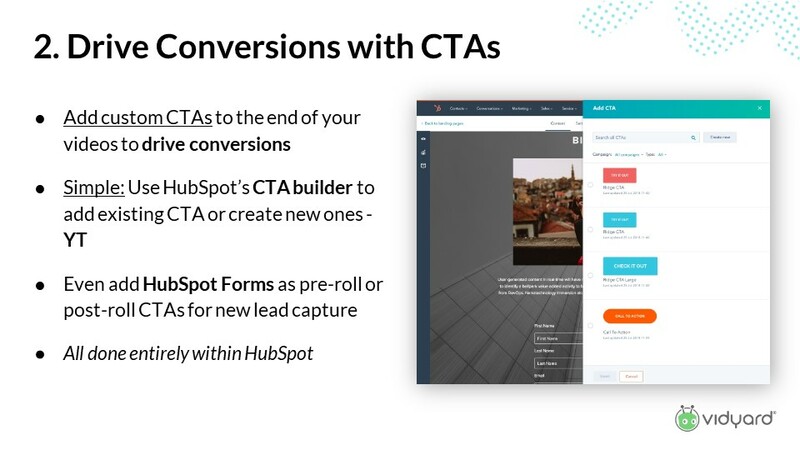 At the end of the video, Jonas was asking if they could send you more testimonials like this and just from using that CTA, they doubled the lead flow from their website. So stuff works. It's why we've grown, it's why we exist. And you can do it all with HubSpot video today. It's very exciting. So we talked about marketing hub, which is the yellow part of this flywheel. And now I want to talk about sales hub and service hub. And I understand you're gonna get a pretty deep dive on service hub a little bit later today, which is incredibly exciting. I think it's a compelling product that really completes the customer journey as it relates to attracting them and getting through to delighting them. So there's an even bigger opportunity in sales, which is this one-to-one video messaging that we've been talking about. The average business professional gets 121 emails a day and all these emails read something like, "are you stuck under a rock?" ,"why aren't you responding to my email?" they're prospecting e-mails sent by salespeople, right? So how do you really stand out as an organisation that is very small, trying to get very big when everybody else is using email in a batch send process, right? It's not personalised. It's not designed for you. 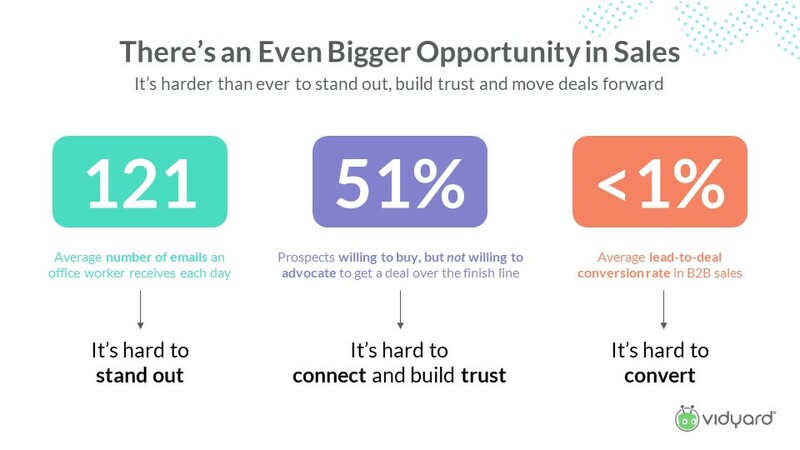 Fifty one percent of prospects are willing to buy but are not willing to advocate internally to get a deal over the finish line. Right? So what does that mean? It's hard to connect and build trust. If you build rapport with one of those buyers, if you have a 51 percent shot at closing an account or selling a deal and you can build rapport, they're more likely to advocate for you internally because you are now part of the limbic response. They have an emotional connection with you, that they couldn't get with you just by using email or just by using phone calls. Seeing your face and building that one to one connection is a very important part of the human to human sales process and once AI starts procuring for us there will be a whole new set of technologies coming to market. The average lead to deal conversion rate of B to B sales is less than one percent, so you're going to close less than one deal from 100 leads. These are all time lows and so it's hard to convert. So how do you use this limbic response? And how do you use things like one to one video, which we saw earlier in the presentation, our preferred communication methods and preferred communication channels, to actually impact any of the stats for the benefit of your business? So this is where HubSpot video for sales and service comes in. And again, your best salespeople are always going to be your customers. 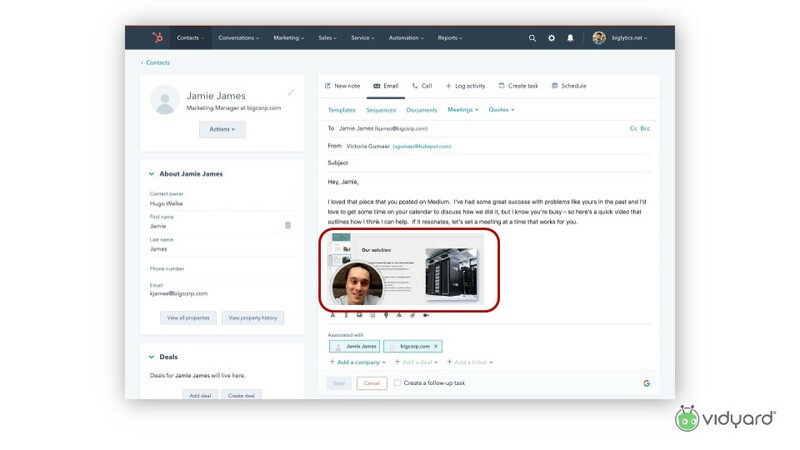 And again this is really small, but inside of sales hub, when you click contacts and you click email, there's a little button there that says, insert video. You click that button you are now a HubSpot video user, simple as that, click some t's and c's. Off you go. You're now using video in your cadence and in your outbound communication, couldn't be easier, and it's free. So what you see here is this, insert video model ,where on the left is a library of content that you previously created. Now, if your organisation is using this product, the content that is approved by your organisation and issued by your marketing team is now available to send in your email cadence. 1) Camera recording. So that's me sitting in front of my webcam delivering a message to you, as we saw in that thumbnail with the whiteboard. 2) Screen recording. If you're not comfortable being on camera, and this is something we see a lot of, you don't need to be front and centre. You can do a screen recording and you can demo the product. You could show someone how to perform a function ,if you're a service representative, and you can have your face included in the bottom corner, to still rebuild rapport and create that engagement, but you don't have to do it. And of course, a quick demo of a feature is often all customers want to see, they don't want the song and dance. They don't want to be handed off from cost shares or an BDR to an account executive, to a solutions consultant to a CSM. They just want to see how the product is going to work for them. So why not do that for them in a simple and effective way, without wasting everybody's time, including your own. 3) Upload a video. 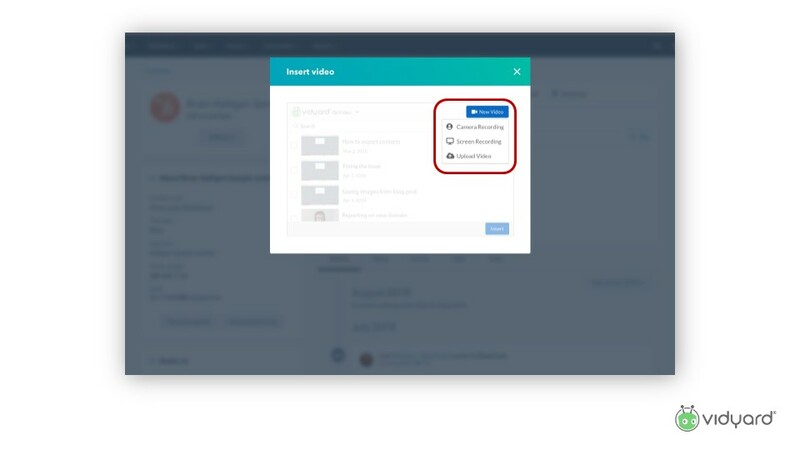 You've got a video on your desktop, something that you've been using and what you're doing is uploading it to email before uploading it to YouTube, grabbing that link, embedding that link or grabbing a picture of that embedding that thumbnail and going through that whole complex process, you can now do it very simply in HubSpot video. Now the reason we built this product, and I kind of touched on that earlier, I think is really worth describing, because we've talked about generation Zs and not being able to use email. That's not an effective method of communicating with people. Guilt is not a good thing in any relationship. What happened was our team was looking for new ways of engaging with clients and so they were recording webcam videos and they were using the whiteboard to write the name of someone ,as you saw in the previous example. And they were uploading that video, they were using quick-time to record the video, uploading it to Vidyard, and then they were taking a screenshot of the thumbnail, dropping that into the email and then hyperlinking that thumbnail to the branded sharing page of the video. And then sitting on the analytics system to watch that video count go from zero to one. And when it went from zero to one, they knew the prospect had watched it and then they were following up. And that process took a lot of time. But it was more effective than sending an email. 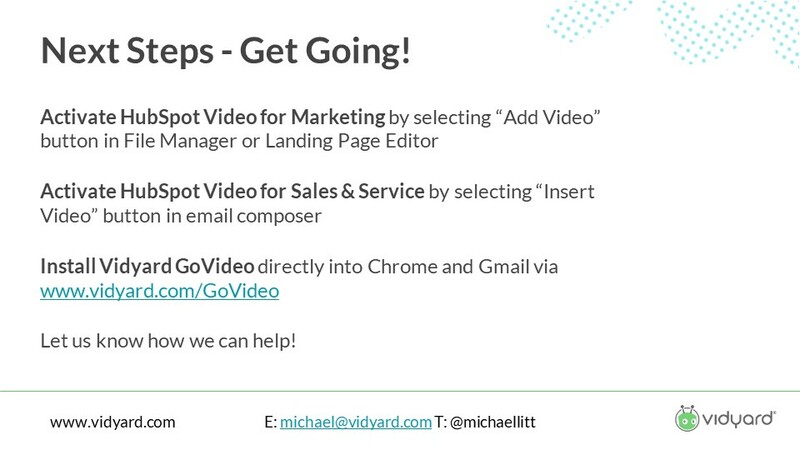 And so we realised we could streamline this process into a couple of button clicks, inside of the workflow, and this is also available in gmail via our chrome app, which again is free and you can find that at vidyard.com/govideo. So you can use an animated thumbnail. And again it's designed to be hyper engaging. Producing a message like that takes less time than writing a customised email. You read a customised email, you labour over the grammar, you want to ensure you're saying things right. What if it gets misinterpreted? You think about that versus just sitting down and communicating your message. It's a lot easier, it's a lot faster and it's way more effective. Question: "The video is in the body of the e-mail, so how do you get them to open that e-mail?" Ideally you're using inbound tactics and these people are already in your funnel. And so instead of getting an email on a wall text, they're getting something which further develops them. Getting through the subject line, I mean ,try animated gifs. That's probably one of the biggest kept secrets of subject line tactics. Little animated rocketship, a bell being rung. These are things that we've been experimenting with and they work really, really, really well. And they work on all email platforms. Yeah. Subject line. I mean it helps if you have a great brand. It helps if you're good at writing great subject lines. We also run a subject line which is like I've made a video for you and people respond to that because they like video. But once you get them in the body of the email, your likelihood of having a conversation is much higher. So HubSpot, the reason why HubSpot video exists, again is Brian Halligan, the CEO of HubSpot, went to the Dublin office and asked a large part of the organisation what was their most effective method of communication and converting leads and prospects and everybody talked about GoVideo. GoVideo is this one to one video communication product. There were already 400 users in that office, using the free products at the time. 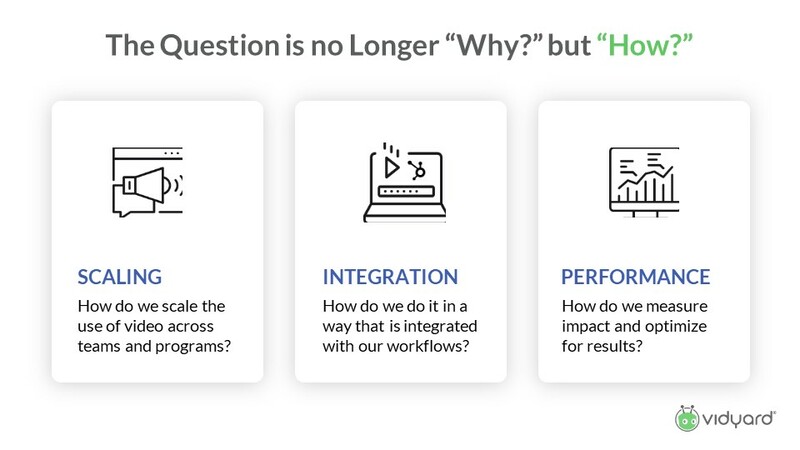 And of course now it's scaled, now they're on HubSpot video and the enterprise version of that product, but they used HubSpot video to improve it's connect rate and create four times more sales opportunities with video. It's a stat that I'm actually remiss to share because it sounds so insane. Anything more than a five percent increase in conversion rate is something that we get excited about. But a 4 x is unheard of in this industry. This stuff really works. It works for HubSpot's style of approach and HubSpot's customers. League is a mobile benefits application that we have Vidyard use. They've been using video for a long time to engage with their buyers, which are human resources buyers, which are emotional buyers, and they saw a three times increase in response rate, because it forced their team to zero in on the most engaged prospects. And one of the things that Kyle, the VP of sales, at League told me is that it's so easy for his team to just send mundane emails to prospects. No offence to the salespeople, but salespeople are genuinely kind of lazy and once they find something that works, they repeat that process until it stops working. Video forces them to think about who they're talking to and forces them to create a strategy and a method of communication that actually engages with the customer. It forces them to do the research before they send that video because they can't just send a mundane non-dynamic asset to that customer. Question: "They can generally send just as dull a video as an e-mail?" Yeah, but if you're forcing them to write the name of the recipient on a whiteboard, largely speaking, they're going to want to do some research on that, that person's name, right? There's always gonna be the conundrum of lazy salespeople, but I do believe that what we've seen when salespeople use this, sales people are motivated by money. And when they see productivity from using a resource or a tool like this, they likely use it a lot more and they likely use it more effectively, which is what we've seen in all these examples. Dynamic Signal used video to increase response rates and reduce meeting cancellations. So if you're selling to marketing, one of the things you're probably very familiar with is that people cancel meetings. So if we're using video to build rapport with the client and they're seeing your face and they know you've created a customised message for them, it's unlikely that they're going to bail on that video and what we do, or bail on that meeting. What we do is we send follow ups before the meeting with video just to confirm that the meeting is happening and it reduces that cancellation rate and it reduces that no show rate significantly, because they're not just dealing with someone over email, that has no face and no identity and is just representing a brand. They're actually dealing with another human and humans generally don't like letting other humans down. 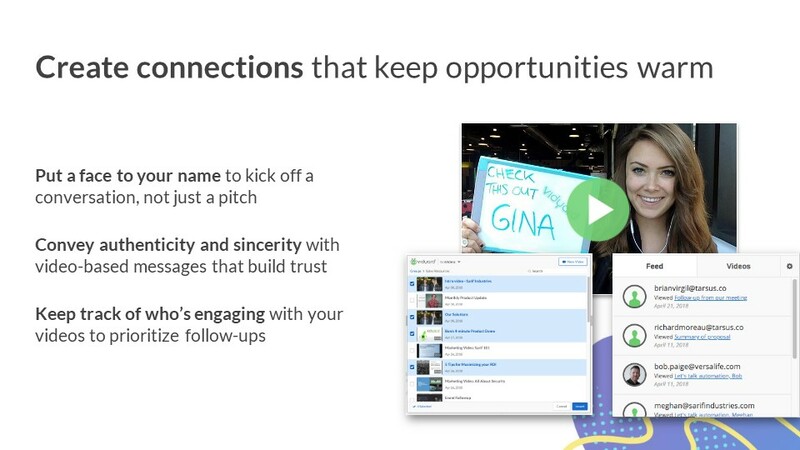 So again, it's about building personalisation, trust, empathy and value ,all in less than 60 seconds and again, if you're sending a complex message with any amount of research, it's easier and faster to send a video message than it is to send an email and I highly encourage you to try it. It's just like building that email muscle. There's always going to be naysayers like these few gentleman in the front row, but that's often because when new technologies come that creates change in your organisation, it can be difficult to adapt and to change to those things, especially if you're not comfortable being on video. Next thing is that it's designed to create connections that keep opportunities warm. So we talked about that limbic response, putting a face to a name to kick off a conversation. It's not just a pitch, it's a conversation. It's about your company. Convey authenticity and sincerity and track who's engaging. The powerful thing about this and why I think sales reps will use it is they send an email off into the ether and maybe they're getting a notification when the client opens that email, you know that somebody opened the email, but it could have just been in their outlook queue right and it could have been the next email that automatically opened just before they were about to delete it in that preview pane. With a product like this, you actually know how much of the video is being watched. So if the client only watched 10 percent of it, you're probably not going to perform an immediate follow up and say "hey, thanks for watching my video". You might perform a followup that says, "hey, I noticed you only watched 10 percent of my video. This is the piece you missed.". 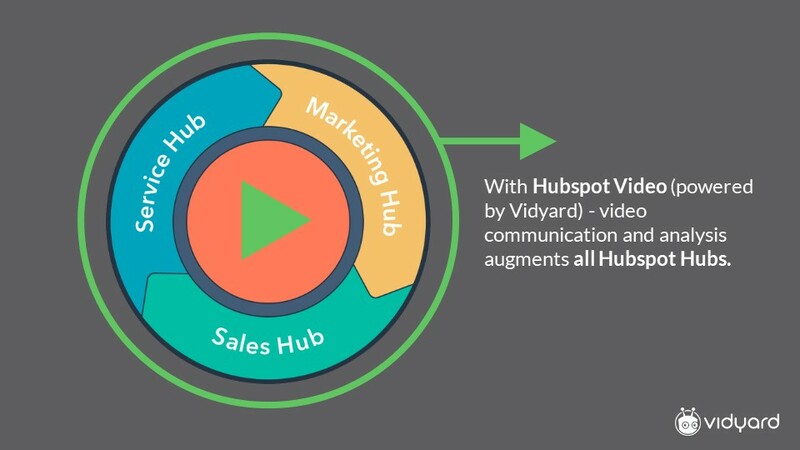 If someone watches 100 percent of your video, you've now got an engaged contact, that you can follow up with immediately, and that's how the workflow of HubSpot video and sales hub is ultimately designed to work. Question: "How do you make this thumbnail idea or this whiteboard seem more professional for senior audiences?" So one, I would always make the argument that people respond better to genuine and informal outreach, especially in today's world than formal and buttoned up because that's what they're used to. And these things break through the noise and we had the same perception when we started doing this. Of course, you could do lots of other things like have a printout and you could add text to the video. You could not do that at all. And again, a lot of the thumbnails might actually be for an IT professional, just a screenshot of what you're showing them in the demo, that's animated. The thing that generally compels people is the fact that there's a play button and again, having an animated gif in that thumbnail just adds a level of interactivity and engagement to that email body that you just wouldn't otherwise get with straight up text. Scale your salesforce to keep deals moving. There's a method here where if you have assets that you know convert, quick demos, that engagement data is showing you are effective. Your sales teams can use those on repeat as they're going through that flywheel and as they're deeper into the funnel process. Not every video needs to be fresh and needs to be new and needs to be personally developed. There is always a method, again, later on in the funnel or later on in the flywheel where this type of content works. How To Unlock More Value Custom Branded Sharing Pages? When someone clicks one of these videos in an email, they're going to a destination to watch it. By default, it's going to be a video or a HubSpot branded sharing page. Why not use your company's information and embed your header and your footer and use that experience to drive them further down your process? The idea of an email is to get an engagement, to get them to visit your website or to get them to do something else in the process. Give them more options. Use CTAs, use branded sharing pages. Use call-to-actions on one to one videos. Every single video we send ,a lot of our customer, ends in a calendly link. A calendly link is a way to look at that person's calendar and automatically book a call, so give your customers the option to book a call right then and there. Don't punt them downfield. Don't wait for them to engage with you. Don't wait for that extra transaction. Give them that option right away. And of course data integration into HubSpot CRM is integral because then every single time your prospect watches one of these videos, that video gets embedded into their contact record with the percentage of what they watched, and that then allows you to do a bunch of reporting around which videos are working, who's watching them, for how long, and how to improve that process with your sales team, which also allows you to manage your sales team more effectively. So if you believe in this and there's three people on your sales team that don't and aren't using it, use the data of the success of everybody else to show them and to manage them accordingly. Here's the quick next steps. And again, not forcing anybody to do anything here, the vast majority of this is available for free. 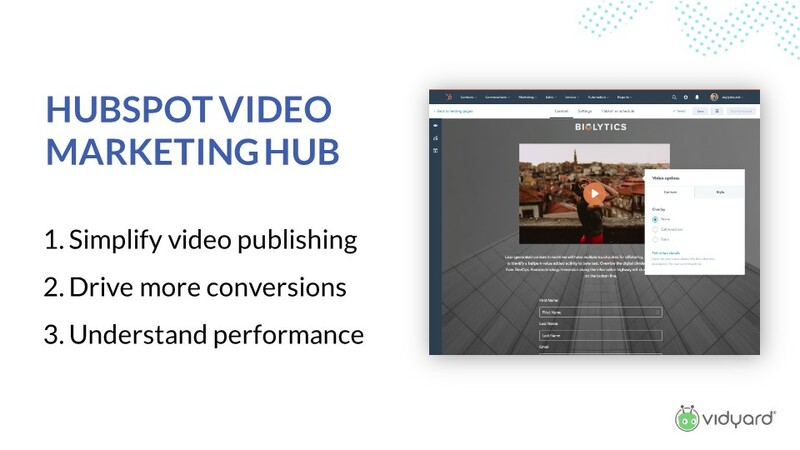 If you're a HubSpot pro or enterprise user, you can activate HubSpot for video marketing by selecting the add video button in file manager or the landing page editor. You can activate it for sales or service by selecting insert video in the email composer or you can install govideo directly if you're using, again, g mail, there's an outlook version as well, by visiting this link. Question: "In that Superbowl sort of example, do you have any practical advice in terms of how to get things moving and advice in terms of expense?" Customer testimonials. Absolutely. If you've got happy customers that have given you, let's say, G2 Crowd reviews, or have talked to analysts, it's time to just sit them down, point a camera at them, ask them questions. Point two cameras at them, two DSLRs, if you have access to it, or two GoPros, get a little lav mic and have that be real in that two-angle shots. Overlay some screenshots and stuff. It's very inexpensive to do that. But again, I would say nine times out of 10, that customer testimonial, if done properly, will convert way better than that Superbowl commercial and at a mere fraction of the cost. Especially those customers are local and you've got people in-field meeting them anyways. We've had sales reps and CSMs just get quick quotes using their iPhone and those have been some of our most highly converting assets, because it's raw, it's gritty, it's in the field. And it's real. Let us know about your experience with video in marketing or sales by putting a comment below this blog post. Book a meeting and let's review the use of video in your marketing and sales campaigns.